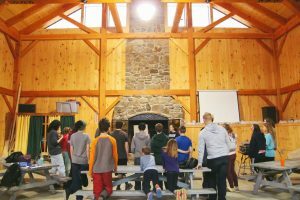 BOBCAT is a shortened, winterized version of BBC summer program for campers in 3rd – 6th grade. 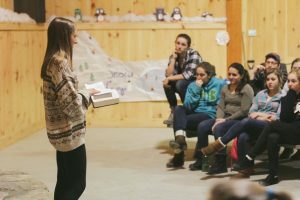 To understand what we do at camp, read this page. It’s about summer but talks about what we do and how we do it. We’ll focus on a theme for the weekend and spend plenty of time playing in this winter wonderland! Check out descriptions and pictures of some of the events below! Our quarter mile long tubing run has three turns and gives you an amazing ride! We provide the tubes and helmets, you provide the fun! Our own Brandon “Tuna” Bergey is a trained Ski Instructor who is excited to teach anyone willing to try! We have our own special skis that allow campers to try cross country and downhill skiing. Our ice rink is the perfect place to play this unique winter sport! Work together as a team to sweep the ball into the opposing teams net. You have to pass a lot, because it’s hard to move quickly on ice! 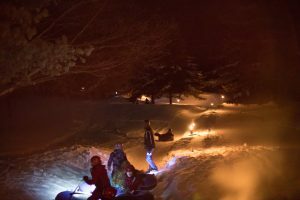 Our big hill by the cross and our 1/4 mile long tubing run make excellent places for some awesome night sledding! We’ll start a fire, set up lights, bring out the smores and then go at it! Our three separate lanes make a great space for racing while giving everyone plenty of places to sled! We provide some sleds, but you can bring your own as well! Don’t own any skates? Don’t know how to skate? No worries! We have plenty of extra pairs and would LOVE to teach you! Fun activities for those who just want to play in the snow! Snow painting, snowman building, and snowball throwing! Our beautiful Vermont setting helps us create safaris, scavenger hunts, animal tracking, and other adventures that are just gorgeous and stunning! Just like Summer Camp, we get to gather each evening to sing fun camp songs and listen to a shepherd share about God! Cookie baking/decorating and homemade snow ice cream are two of our favorite winter treats! No need to cook your own food during Winter Camp! We have a wonderful kitchen team ready to serve up hot meals all weekend long! Pancakes, Lasagna, Grilled Cheese, and, of course, Baked Oatmeal! Outside isn’t the only place to have fun! With the new pavilion, we can run around playing large group events, as well as smaller group games like Gaga, Whizzball, and more! Super comfy couches, air hockey, ping pong, and foosball. 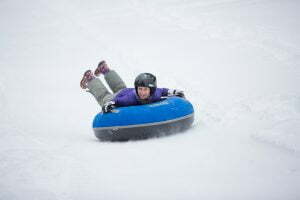 This is one of the most fun places on the property and it’s totally unique to Winter Camp! At Bobcat we do crafts unique to the Winter Program: Penguin puppets, snowflakes, handmade pillows, and more! Campers also love warming up by the fire to play games like Spot It, Apples to Apples, and Dutch Blitz. Registration is Friday from 6:30 – 7:00pm. Pick up is Sunday at 2pm. Shuttles will be available at the bottom of Lynds Hill Road in case of inclement weather, Call the office or check online for more information the day camp begins and ends. 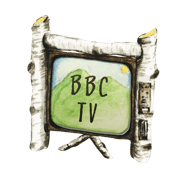 New to BBC? Check out our New Parent’s page!